The Cytochrome P450 1B1 (CYP1B1) is a key P450 enzyme involved in the metabolism of exogenous and endogenous substrates. Previous studies have reported the existence of CYP1B1 L432V missense polymorphism in prostate, bladder and renal cancers. However, the effects of this polymorphism on the risk of these cancers remain conflicting. Therefore, we performed a meta-analysis to assess the association between L432V polymorphism and the susceptibility of urinary cancers. We searched the PubMed database without limits on language for studies exploring the relationship of CYP1B1 L432V polymorphism and urinary cancers. Article search was supplemented by screening the references of retrieved studies manually. Odds ratios (OR) and 95% confidence intervals (95% CI) were calculated to evaluate the strength of these associations. Simultaneously, publication bias was estimated by funnel plot and Begg’s test with Stata 11 software. We observed a significant association between CYP1B1 L432V polymorphism and urinary cancers. The overall OR (95% CI) of CC versus CG was 0.937 (0.881-0.996), the overall OR (95% CI) of CC versus CG + GG was 0.942 (0.890-0.997). Furthermore, we identified reduced risk for CC versus other phenotypes in both prostate and overall urinary cancers, when studies were limited to Caucasian or Asian patients. This meta-analysis suggests that the CYP1B1 L432V polymorphism is associated with urinary cancer risk. Prostate cancer, urothelial carcinoma and renal cancer are common cancer types and major cause of cancer-related death worldwide[1, 2]. Smoking, diet and environmental factors have been reported to contribute to the carcinogenesis of these malignancies[3, 4]. However, the fact that a small fraction of people exposed to these carcinogens eventually develop urinary cancers suggests that individual genetic predisposition factors may contribute to carcinogenesis. Cytochrome P450 1B1 (CYP1B1) is a member of the CYP1 gene family and one of the major enzymes involved in the hydroxylation of estrogens, involved in the oxidative activation and deactivation of xenobiotics[5–7]. Several polymorphisms in the CYP1B1 gene have been reported, including 4326C/G (L432V, rs1056836) in exon 3, which encodes the heme-binding domain, have been associated with enhanced catalytic activity when compared to the wild-type allele[8–10]. Polymorphisms in XPC and MHTFR gene have been reported to be associated with overall urinary cancer risk[11, 12], suggesting that urinary cancers share common mechanisms in the process of DNA repair and carcinogen metabolism. Several case–control studies were performed to identify the association of CYP1B1 polymorphisms with prostate, bladder and renal cancer risk. However, small sample sizes and limited populations in study design have often yielded inclusive results among the studies[13–29]. The inconsistent conclusions may have resulted from difference ethnic backgrounds and relatively small sample sizes. 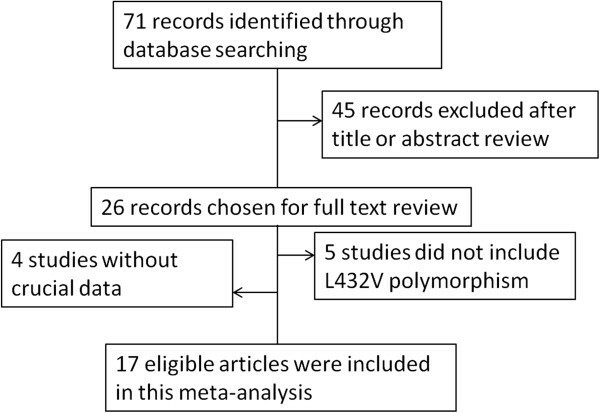 To validate the potential association between the CYP1B1 Leu432Val polymorphism and urinary cancer risk, we conducted a meta-analysis of data reported in 17 studies including 7,944 cases and 7,389 controls. Medline, PubMed, Embase and Web of Science were searched for all relevant articles with the following terms: “Cytochrome P450 1B1” or “CYP1B1”, “polymorphism” or “variant”, “case–control”, “risk”, “association”, “prostate cancer”, “bladder cancer” and “renal cancer” (last search was updated on Feb 10, 2014). References of the retrieved articles on this topic were also manually screened for additional relevant eligible studies. We defined inclusion criteria as follows: written in English; case–control design; sufficient information for estimating odds ratio (OR) and their 95% confidence interval (CI); observed genotype frequencies in the controls in agreement with Hardy-Weinberg equilibrium (HWE). Abstracts and unpublished reports were not considered. Investigations in subjects with family history or cancer-prone disposition were also excluded. Meanwhile, if studies had overlapping subjects, we selected the most recent study that included the largest number of individuals in the publications. This study was approved by the ethics committee of the Second Affiliated Hospital of Nanchang University. Two investigators independently extracted the following information from each study: the first author, year of publication, country of origin, ethnicity, source of controls (population-based, hospital-based and mixed controls), genotyping method, number of genotyped cases and controls, number of genotypes for three CYP1B1 polymorphisms in cases and controls, and main findings. Hardy–Weinberg equilibrium (HWE) was evaluated for each study, using the goodness-of-fit chi-square test. P < 0.05 was considered representative of departure from HWE. Crude OR with 95% CI was used to assess the strength of association between the three CYP1B1 L432V polymorphism and urinary cancer risk. Then, we calculated the pooled ORs and 95% CIs. Heterogeneity assumption was checked by the chi-square-based Q-test. A P value greater than 0.10 for the Q-test indicates a lack of heterogeneity among studies, so the pooled OR estimate of the each study was calculated by the fixed-effects model (the Mantel–Haenszel method), the random-effects model (the Der-Simonian and Laird method) was used otherwise[30, 31]. To assess the effects of individual studies on the overall risk of cancer, sensitivity analysis was performed by excluding each study at a time individually and recalculating the ORs and 95% CIs. We also used the inverted funnel plot and the Egger’s test to examine the potential influence of publication bias (linear regression analysis). The significance of the intercept was determined by the t-test suggested by Egger (P < 0.05 was considered representative of statistically significant publication bias). All statistical tests were two-sided, and a P-value of < 0.05 was considered statistically significant. Statistical tests were performed with STATA version 11.0 (Stata Corporation, College Station, TX) or SAS software (version 9.1; SAS Institute, Cary, NC). We identified a total of 71 relevant publications after initial screening. Among these, 26 publications had met the inclusion criteria and were subjected to further examination. We excluded 4 publications because they did not present detailed genotyping information. We also excluded 5 publications because they did not include L432V polymorphism. Our final data consisted of 10 publications with a total of 5949 cases and 5388 controls for prostate cancer, 5 publications with 1658 cases and 1593 controls for bladder cancer, 2 publications with 337 cases and 408 controls for renal cancer (Figure 1). Of these, there were 10 hospital-based studies and 7 population-based studies. Characteristics of included studies are summarized in Table 1. The flow chart of the included studies in the meta-analysis. Abbreviations: SNP Single nucleotide polymorphism, HB Hospital based, PB Population based, RFLP Restriction fragment length polymorphisms, AS-PCR Allele specific PCR, ND Not described. aStatistical power to detect an OR of 1.5 (or 0.67 = 1/1.5). Table 2 lists the main results of this meta-analysis. 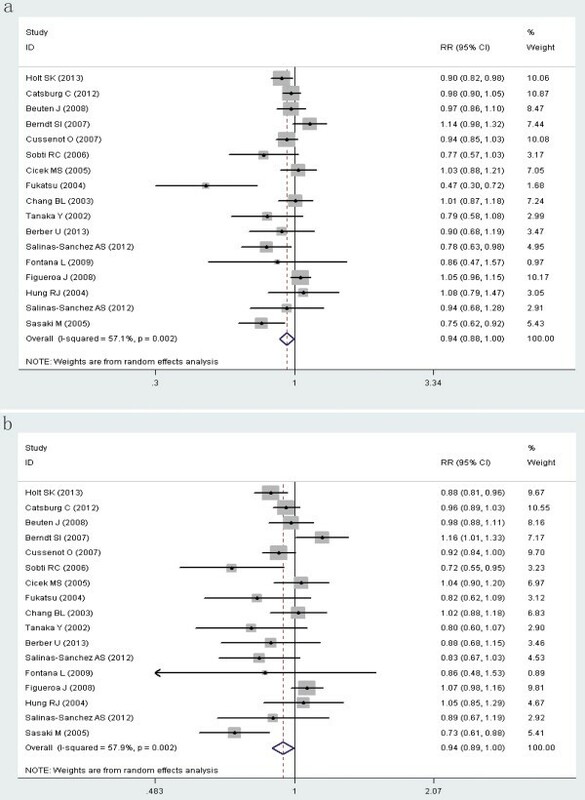 Overall, significant associations were found between CYP1B1 L432V polymorphism and urinary cancer risk when all studies pooled into the meta-analysis (CC vs CG: OR = 0.937, 95% CI = 0.881-0.996; CC vs CG + GG: OR = 0.942, 95% CI = 0.890-0.997; C vs G: OR = 0.957, 95% CI = 0.917-0.998) (Figure 2). In the subgroup analysis, L432V polymorphism was significantly associated with prostate cancer or overall urinary cancer risk when population was defined as only Caucasians or Asians (Additional file1: Table S1). Nevertheless, when studies were restricted to population-based or hospital-based studies, none of these comparisons showed significant differences. The FPRP values for significant findings at different prior probability levels were also calculated. For a prior probability of 0.1, assuming that the OR for specific genotype was 0.67/1.50 (protection/risk), the FPRP values were 0.786, 0.79 and 0.794 for an association of overall CC vs CG, CC vs CG + GG and C vs G genotypes with an increased lung cancer risk. Forest plot (Random effects model) describing the association of the CYP1B1 L432V polymorphism with risk of urinary cancers. The CC phenotype was associated with a modestly decreased risk of urinary cancers (a, CC vs CG; b, CC vs CG + GG). Heterogeneities were observed among studies for the association between the CYP1B1 L432V polymorphism and urinary cancer risk (CC vs GG, CC vs CG, CC vs CG + GG, C vs G for prostate cancer; C vs G for bladder cancer; CC vs GG, CC vs CG, CC vs CG + GG, C vs G for overall urinary cancers). Therefore, we used the random-effects model that generated wider CIs. For the other groups of comparisons, no heterogeneity was found among studies and the fixed-effects model was performed (Table 2, Additional file1: Table S1). The leave-one-out sensitivity analysis indicated that no single study changed the pooled ORs qualitatively (data not shown). The shapes of the funnel plots seemed symmetrical, and Egger’s test suggested that publication bias was only found in the CC vs GG group of bladder cancer (Table 2, Additional file1: Table S1). In this meta-analysis, we tested the association between L432V polymorphism in the CYP1B1 gene and urinary cancer risk by comparing the allele frequencies from 17 published studies. We observed a significant association of L432V polymorphism with overall urinary cancer risk, as well as in the subgroups defined as Caucasian or Asian populations. Urinary system tumorigenesis is a complex event, in which different carcinogenic chemicals are involved. Prostate is a hormone-responsive organ in which androgens are believed to stimulate growth and secretory functions. Evidences have been shown that CYP1B1 protein is highly expressed in prostate cancer tissues, while not in normal prostate tissues. It has been reported that different allelic variants of CYP1B1 have different catalytic activities and specificities to procarcinogens, thus partly explains molecular mechanism of CYP1B1 in carcinogenesis. Except for prostate cancer, case–control studies have shown inconsistent associations between CYP1B1 L432V polymorphism and bladder cancer and renal cancer risk[24, 28, 29]. However, exact mechanisms of how CYP1B1 polymorphism contributes to urinary cancer susceptibility requires further illustration. Some limitations of this meta-analysis should be discussed. First, the total number of included studies of bladder cancer and renal cancer was relatively small. Second, our results were based on unadjusted estimates, while a more precise analysis is needed if individual data were available, which would allow for the adjustment by other factors such as age, smoking status, drinking status. Finally, unpublished data may have not been included in the current analysis, potentially causing a bias in the results. In conclusion, this meta-analysis suggests that the CYP1B1 L432V polymorphism is associated with urinary cancer development, especially in specified Caucasian and Asian populations. However, studies with larger number of samples from homogeneous urinary cancer patients are needed. Further biological investigations may eventually lead to better understanding of the association between the CYP1B1 polymorphism and urinary cancer risk. This work was supported by Scientific Program of the Department of Education, JiangXi Province, China (GJJ13047). WF J, G S and JH X conceived and performed statistics, WF J, XQ X and ZM S extracted data and wrote the manuscript, G S and ZM S revised the manuscript. All authors read and approved the final manuscript.